If you have encountered an energy drink in the past that looked like the cartridge of Nitrous Oxide Systems, then you have seen the original Nos Energy Drink bottle, which was once distributed that way. However, it was discontinued in 2015 and is not available in 16 ounce and 24 ounce cans. Nos Energy Drink was introduced and launched in 2005 by the Fuze Beverage Company, which is a manufacturer of teas and non-carbonated drinks that are enriched with vitamins. After two years, Fuze was purchased by The Coca Cola Company and the sale was finalized in February 2007. Below are the latest NOS Energy prices. Because of the sale to Coca Cola, the NOS license was transferred to Coca Cola. But the transfers do not end there because on June 12, 2012, Coca Cola also announced the transfer of its energy division to Monster Beverage. So, Nos Energy became a part of Monster Beverage Corporation and is still produced by Monster up to this day. Like most energy drinks, the main source of advertising of Nos Energy is through its involvement in various forms of motorsports. In fact, NASCAR driver Kyle Busch, Formula Drift Driver Chris Forsberg, and rally car racer Riley Herbst are all part of Team NOS. Busch became a Team NOS driver back in 2008 he has raced the No. 18 NOS Energy Toyota Camry to victory several times. He is also the all time leader in race wins from 2008 to 2011, until he switched to Monster Energy, which was still a rival of Nos at that time. But when Monster acquired Coca Cola’s energy beverage products, Busch was aligned with Nos Energy in 2016. The partnership of Nos Energy and Kyle Busch is considered to be the largest in the history of the brand, that is why it was only appropriate to have a Nos flavor dedicated to Busch. So, in the fall of 2016, Monster Beverage released the Nos Rowdy flavor which was inspired by Busch’s nickname, Rowdy. Nos Energy is indeed one of the popular names when it comes to energy drinks. After all, it gives the increased energy that you need to keep you going and reaching your daily goals. However, you also need to keep in mind that this drink is not recommended for children, pregnant or nursing women, or people with sensitivity to caffeine. 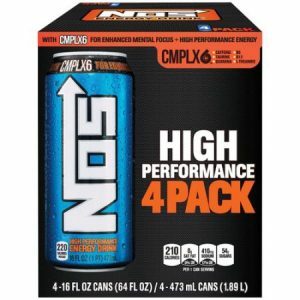 There are different Nos Energy flavor variants available in the market but generally, they have the following ingredients: carbonated water, high fructose corn syrup, citric acid, sodium citrate, sodium hexametaphosphate (preservative), caffeine, taurine, natural flavors, acacia, potassium sorbate (preservative), glycerol ester of rosin, inositol, sucralose, yellow 5, calcium disodium edta (preservative), pyridoxine hydrochloride (vitamin B6), yellow 6, guarana, cyanocobalamin (vitamin B12). Currently, there are six available flavors: Original, Original Sugar Free, GT Grape, Cherried Out, Charged Citrus, and Rowdy. All these flavors are available in 16 fluid ounces can, while only the Original flavor is available in a 24 fluid ounces can, and 12 fluid ounces cans in a 6-pack. If you look at the nutrition facts of the different flavors, below are the contents per 16 fluid ounces can. Original: 210 calories, o grams fat, 410 mg of sodium, 54 grams of total carbohydrates, 53 grams of sugar, and 0 grams protein. Original Sugar Free: The sugar free variant only contains 180 mg of sodium in its nutritional content. GT Grape: 210 calories, 0 grams fat, 410 mg of sodium, 54 grams of total carbohydrates, 54 grams of sugar, and 0 grams protein. Cherried Out: 200 calories, 0 grams fat, 310 mg of sodium, 54 grams of total carbohydrates, 53 grams of sugar, and 0 grams protein. Charged Citrus: 200 calories, 0 grams fat, 230 mg of sodium, 56 grams of total carbohydrates, 54 grams of sugar, and 0 grams protein. Rowdy: 190 calories, 0 grams fat, 220 mg of sodium, 51 grams of total carbohydrates, 50 grams of sugar, and 0 grams protein. For the 24 fluid ounces in Original flavor, it contains the following: 310 calories, 0 grams fat, 620 mg of sodium, 81 grams of total carbohydrates, 80 grams of sugar, and 0 grams protein. For the 12 fluid ounces in Original flavor, it contains the following: 160 calories, 0 grams fat, 310 mg of sodium, 40 grams of total carbohydrates, 40 grams of sugar, and 0 grams protein. When it comes to the caffeine content, there are 80 mg of caffeine per 8 fluid ounces serving, or 160 mg per can of Nos Energy Drink.